Get the inside story of what it's really like after you give birth. Didn't matter, I thought. I already knew everything there was to know about having a baby. But then I actually had my baby. And while I was elated, I was also exhausted. And in pain. And oozing a ridiculous amount of bodily fluids. Plus I had to go to the bathroom—a formerly noxious situation that suddenly required a squirt bottle and had me justifiably plagued with fear. Why, oh why, hadn't anybody warned me? Enter new mom Bekki Pope, a blogger who gave birth to son Barnaby back in July. 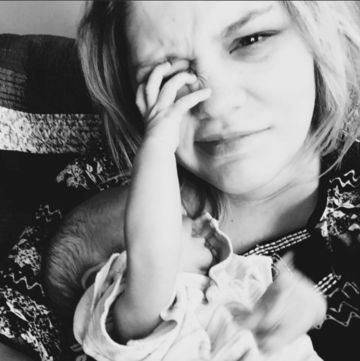 Now that she's had a few months to settle into motherhood, she took to Facebook to share the real postpartum deal in a post she titled "20 things to know the day after you push out a baby." And while her hilariously honest advice is about 14 years too late for me, the post should be required reading for every first-timer on the planet who finds herself wondering why she ever agreed to pull the goalie in the first place. "Bring lots of pads with you. The huge ones that make you feel like you're wearing nappies. You'll end up putting three on at a time." "Put scratch mitts on your child. Because after nine months happily growing away, you've given birth to a baby with fingers like Edward Scissorhands." "If you want to leave, tell them in the morning and you'll be out within the year. They take so long to finish your papers the baby will be walking out of the ward itself by the time they're done." "You get through your front door and plonk the car seat down on the nearest surface (it's bloody heavy)," she writes. "You give each other a look of utter relief that you didn't crash on the way home and that you got the baby here safely. You mentally high five each other. You stare at it for a while. Just. Stare. It's asleep. It's not crying. It doesn't need anything.... You both just stand there for another hour. You finally decide to ask the most important question of the past nine months... 'Can I drink some wine now?'"